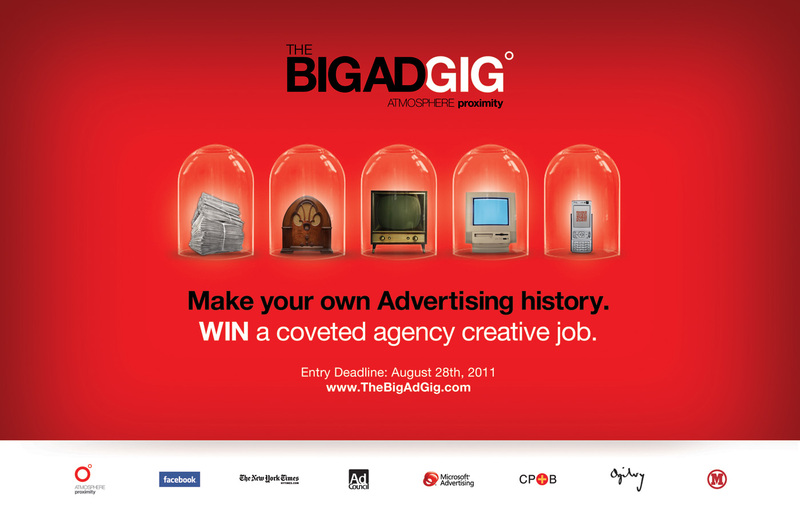 The Big Ad Gig, a competition to win a 30-day paid freelance position in an advertising agency, is running for the third year as part of Advertising Week 2011 in New York. The event, sponsored by Atmosphere Proximity, The New York Times, Facebook and Microsoft, is being promoted on the Webby-awarded site, www.thebigadgig.com. 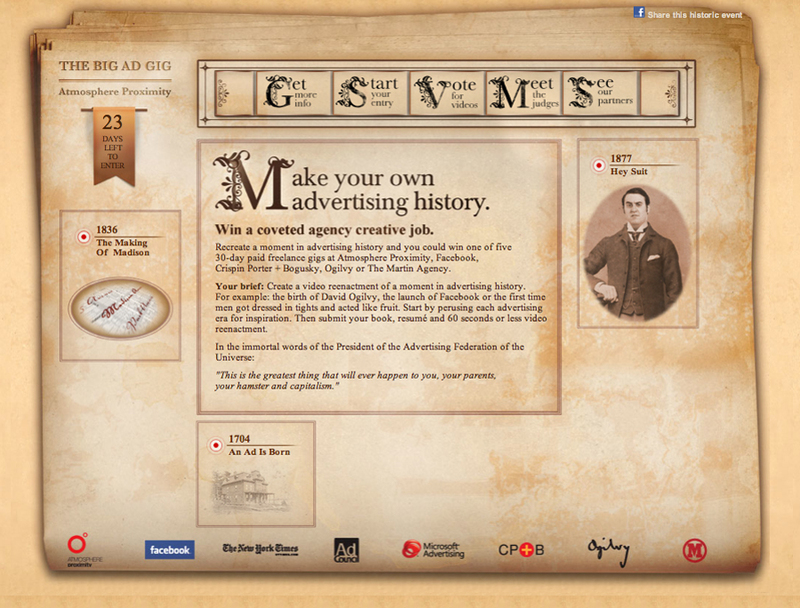 The website and creative for this year’s event centers on “re creating a moment in advertising history”. Creatives interested in a stint at Atmosphere Proximity, Facebook, Crispin, Porter & Bogusky, Ogilvy and The Martin Agency are challenged to create a video reenactment of a moment in advertising history — the birth of David Ogilvy, the launch of Facebook, or the first time men got dressed in tights and acted like fruit. 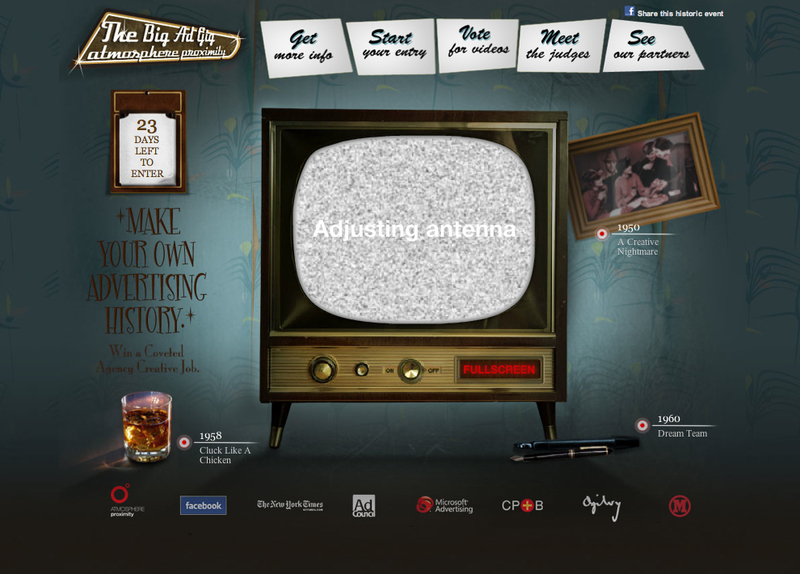 The call for entries ends August 28th. The 2011 Big Ad Gig panel includes Steve Simpson, CCO, Ogilvy North America, Rob Reilly, WW CCO, CP+B, John Norman, CCO, The Martin Agency, Carolyn Everson, VP Global Marketing Solutions, Facebook, Priscilla Natkins, EVP, The Advertising Council and Andreas Combuechen, CEO/CCO, Atmosphere Proximity. Moderator for the third year running is New York Times advertising columnist Stuart Elliot. Applications close on August 28. On September 1st, the judges will narrow the field down to 16 contestants based on the quality of their videos and online portfolios. 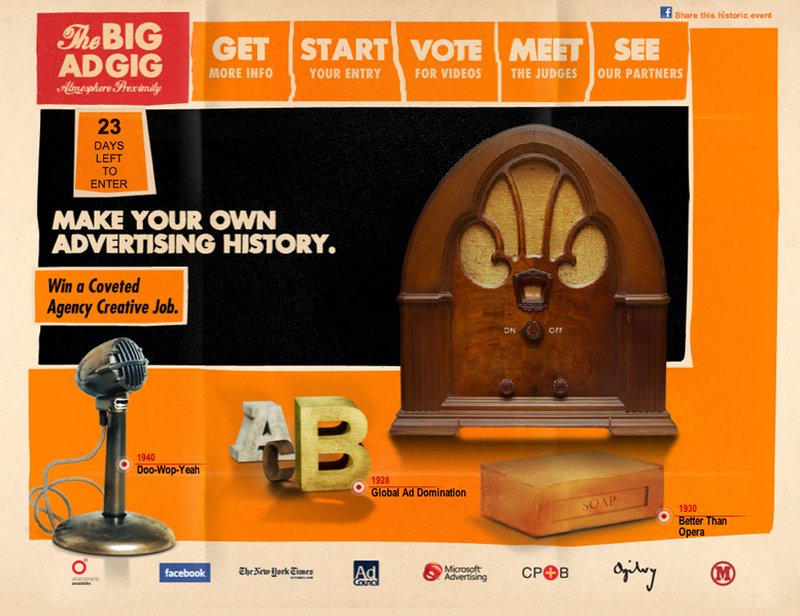 At that point, the public will be invited to vote on who should be the eight finalists who compete at The Big Ad Gig in New York. Selected finalists will be notified and invited to attend Advertising Week from October 3rd -7th in NYC and given access to certain panels and parties. 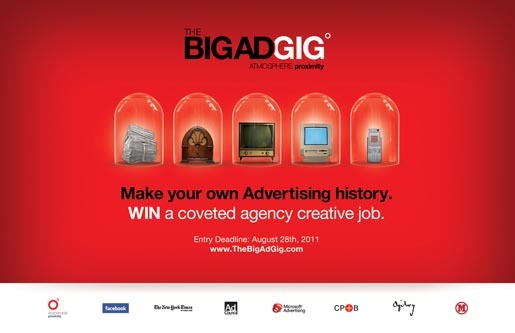 They will also be given the Ad Council Facebook creative brief that will serve as their final exam at The Big Ad Gig Live Event. At the live event on October 4th at 3pm, in The New York Times Building, each finalist will be given 4 minutes to present their solution to the Ad Council assignment in front of our panel of judges and a live audience. 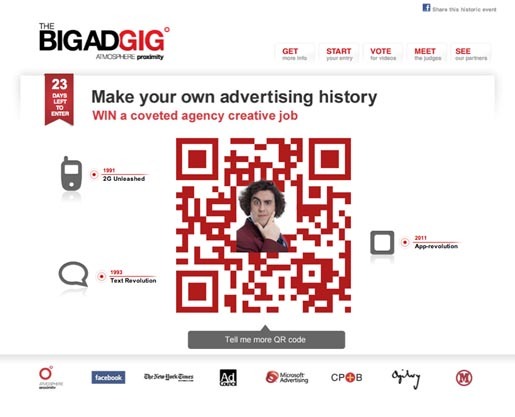 At the end of the event, five finalists will be awarded 30–day paid art director or copywriter positions at one of the participating agencies and companies. One winning campaign will be produced and run on Facebook and various Microsoft advertising platforms including mobile, gaming and online. 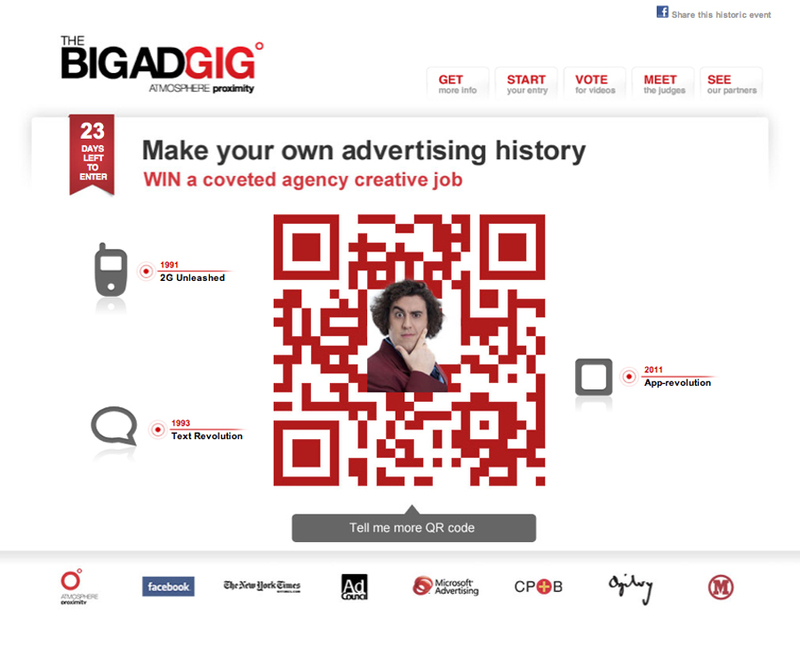 The Big Ad Gig campaign was developed at Atmosphere Proximity, New York, by chairman/CEO Andreas Combuechen, senior executive creative director Stewart Krull, creative director Tim McKee, associate creative director Joel Bloom, senior art directors Tim Wolf, Rob Bigwood, Axel Gimenez, art director Anna Lippert-Haczkiewicz, executive director, creative technologies David Moore, executive director mobile and social media David Bear, director of communications Michelle McCourt, senior developer Wonil Suh, developers Marissa Lere and Ken Shor, and agency producer Logan Clevenger. Filming for the 1950s TV spot was shot by director Brad Hasse via East Pleasant, New York, with director of photography Clint Byrne, executive producer Sarah Roebuck and producer Nicholas Oscoff, with editor Will Znidaric and audio mixer Tim Korn at Pleasant Post. The Big Ad Gig internet spot was produced at EP*Vision by creative director/lead designer Maryam Parwana, directors Maryam Parwana and Brad Hasse, designers/animators Brian Walsh and Lessa Millet, and executive producer Sarah Roebuck.